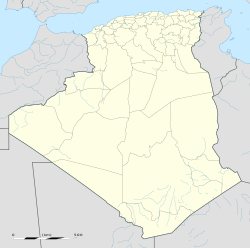 Chelghoum Laïd is a city in Chelghoum Laïd District, Mila Province, Algeria. In 1998 it had a population of 42,000. Chelghoum laid is the biggest city in Mila province. It is known for its fruit and vegetable national market. This article about a location in Mila Province is a stub. You can help Wikipedia by expanding it. This page was last edited on 12 January 2019, at 11:32 (UTC).